Balinese Yellow Rice, also know as Nasi Kuning (or sometimes Nasi Kunyit) is an Indonesian rice dish cooked with coconut milk and turmeric, hence the name nasi kuning (yellow rice). Nasi kuning might come in the form of a cone called a tumpeng and is usually eaten during special events. The rice looks like a pile of gold, so it is often served at parties and opening ceremonies as a symbol of good fortune, wealth and dignity. As I indicated in the introduction for Thai Peanut Sauce, one of my favorite kitchens other than my own is in the home of Jim and Jennifer Ford. Jim is practically a Zen Master when it comes to flavors, layers and textures in food. I suspect that much of that comes in part from the year-long, around the world trip he and his family took a number of years ago. They hit four of the five continents in eight months and during that time experienced a range of food that the rest of us can only dream about. Anyway, Jim is a fabulous cook. I truly enjoy what he does in the kitchen. A group of us were sharing a mid-summer evening meal together at Jim and Jennifer’s home and Jim had prepared chicken sataé over which we drizzled the Thai Peanut Sauce. Well, that was so good we just started dunking. But that’s only part of the story. As a side dish, Jim prepared this Balinese Yellow Rice which is known as Nasi Kuning. It was, without reservation, the best rice dish I’ve ever had. Okay, the chicken was great, but I think we all went back to the rice until it was all gone. Place the rice in a large bowl and add cold water to cover by 3 inches. Swirl the rice around with your fingers until the water becomes cloudy, then pour through a strainer to drain. Repeat until the water remains clear, 4 to 6 rinsings. Place the coconut water, chicken broth, coconut milk, lemongrass, galangal, turmeric, and salt in a large heavy pot and bring to a boil over high heat. Add the rice and return the water to a boil. Reduce the heat to low and cover the pot tightly. Cook the rice until just tender, 15 to 18 minutes. Remove the pot from the heat and let the rice stand, covered, for 5 minutes. Gently fluff the rice with a fork. Remove the lemongrass and galangal slices. 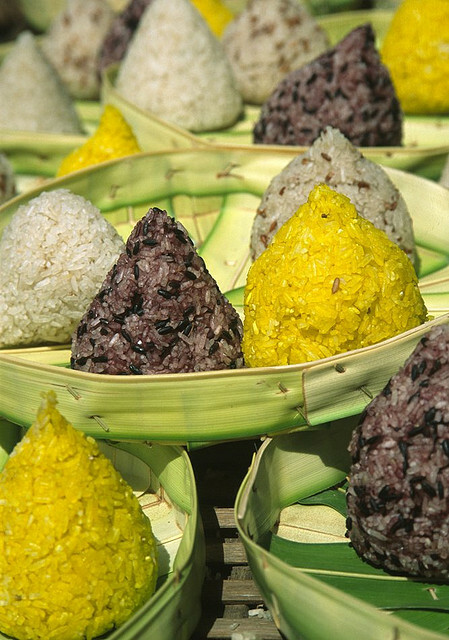 To serve the rice in the traditional Balinese manner, pack it into a lightly oiled large funnel or other cone-shaped mold. Let stand with the wide opening propped up in a deep bowl or pot covered with aluminum foil for 3 minutes. Place a platter over the base of the mold and invert and unmold the rice onto it. This towering cone of rice-gilded with turmeric and perfumed with lemongrass and ginger-symbolizes Bali’s most sacred Mount Agung. As such, it’s a fitting centerpiece for megibung, the Balinese rice table. A megibung is a sort of smorgasbord of Balinese delicacies, which would invariably include babi guling (Balinese Roast Pork) and a variety of satés. Note that the traditional rice for this dish is Balinese long-grain rice. The closest approximation available in this country is Thai jasmine rice. Also, coconut water is the liquid inside the coconut.